Retired as District and Sessions Judge of Mysore High Court. Prior to this he was a Munsiff and Registrar of the High Court in Bangalore. He was a brilliant attorney who chose to be a judge. He was a protege of Chief Justice of the the Mysore High Court Sir D'arcy Reilly (the last serving British Chief Justice, 1934-43) and Justice Venkata Rangiengar. Sama Iyengar was born in Sargur. He lost his father at the age of three. His mother, though a deaf mute, was skilled in cooking and loved to cook large quantities of food for visiting farmers. His maternal grandfather was a court poet of the Maharaja of Mysore who translated Krishna Karnamritha from Sanskrit to Kannada. Sama Iyengar put himself through school studying under street lights. He went to Maharaja's College in Mysore and studied law in Bombay. His legal career led him to appointments throughout the old Mysore state including Chikmaglur, Tumkur, Kolar and Mysore. 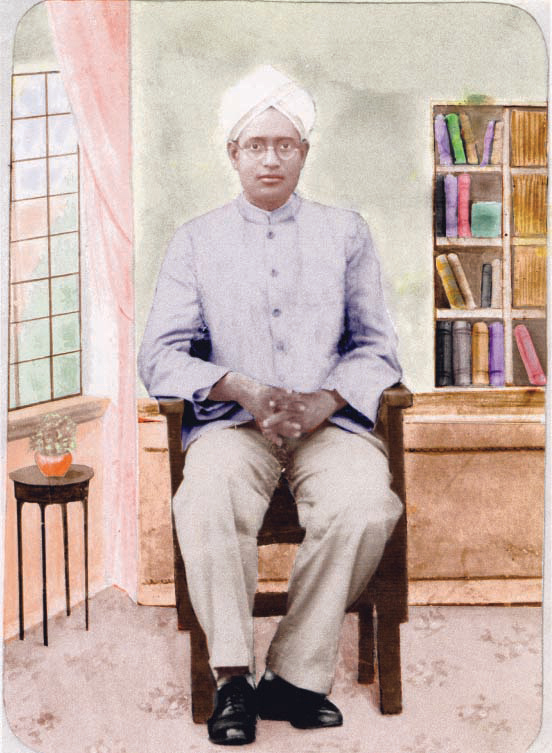 The portrait above was a pencil sketch made in Kolar (which has been retouched in color by his great-grandson Ashok Srihari). Sama Iyengar was an ardent member of the Theosophical Society. A regular attendee of the annual convention of the Theosophical Society in Adyar, Madras, he had an opportunity to hear Annie Besant under the great banyan tree. He subsequently referred to Mrs. Besant as "mother". His study of theosophy exposed him to western philosophy and contact with the greater world outside his own. "Yogaha karmasu kaushalam..." which implied that dexterity in action is yoga. "Vyavasayatmikaa budhi ekeva kurunandana bahushakah ananthasys buddhi avyaya saayina.." implying that the disciplined mind moves in a single pointed direction whereas when it is undisciplined it wanders in unproductive ways. "Uddharth atmanatmanam .." meaning lift your self by your own efforts for you can be your own friend or ones own enemy. "Adhveshtaa sarvabhutanam mytri karuna evacha.." meaning treat every being with friendliness and compassion and without attachments, considering grief and happiness equally. "Anudvega karam vakyam .." one's speech should not disturb the hearer and at the same time truthful and pleasing too. Sama Iyengar was an ardent "rasika" or fan of Carnatic music. His favorite ragas were Kanada (e.g., Ramamantrava Japiso) and Atana (e.g., Balakanaka Maya). He was a fan of theatre and cinema. An avid gardener, he cultivated a variety of fruit trees (sapota, amtekai, mango, mulberry, coffee, breadfruit, grape, jackfruit) and flowering plants in his beloved home at 958, Laxmipuram in Mysore. Some visitors who came to meet him saw a man watering and tending to his garden in a dhoti and undershirt and took him to be the mali (gardener) and asked to see the judge. He made them come inside the house and appeared again wearing a shirt to their great surprise!